In recent years, sales of used and refurbished CT equipment have increased steeply throughout the world. Historically, used and refurbished imaging equipment was purchased by medical facilities in third world countries and rural areas. In the mid-1990’s, with managed care perceived as a likely response to spiraling medical costs, demand increased in US urban areas as well as large US hospital chains began opting for used CT equipment. A limited amount of relatively new CT equipment becomes available as top tier medical centers replace equipment in an effort to maintain a technology advantage over competitive health care facilities, and in order to provide physician-researchers with the cutting edge technology that they need to conduct novel studies. Larger quantities of used CT equipment has become available as medical centers and free-standing imaging centers have been shuttered or downscaled as a result of the economic downturn. Equipment from these centers is sold to raise funds for debt settlement and refurbished for resale. On the demand side, medical centers in the US as well as around the world are seeking ways to maximize return on their medical equipment budgets. With used CT equipment generally available at half the cost of similar new equipment, purchasing used CT equipment is an ideal way to reduce the cost of providing important diagnostic services. The cost of a new CT can exceed a million dollars, while refurbished equipment may be sold for less than half the original price. 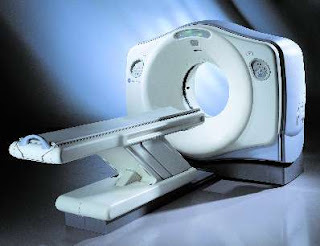 Used CT equipment is refurbished and offered for sale by major CT manufacturers such as GE and Siemens. A number of engineering service companies also refurbish the equipment for resale. Equipment that is to be resold is inspected at the original site and de-installed. All performance records are examined for evidence of malfunctions. Only CTs for which replacement parts are available—and will continue to be available—are refurbished. Once a CT has been determined to meet established criteria, it is shipped to a factory or workshop, where the used CT equipment is disassembled and thoroughly cleaned. Painted parts are touched up or repainted. Broken or worn parts are replaced with original replacement parts. System software is checked for bugs and updated to the most recent versions. Systems may be customized. Used CT equipment is tested thoroughly for safety and performance before being shipped to the purchaser’s site for installation. I don't see any thing is wrong when we use the used equipment of others. This much better than using nothing at all. The risk of just ignoring the equipment because of its being old is dangerous. CT scan machines are on the cutting edge of diagnostic imaging. The finely detailed results they give are invaluable to physicians. Thanks admin for sharing such awareness among people through this post that they can use used medical equipment at comparatively low cost.